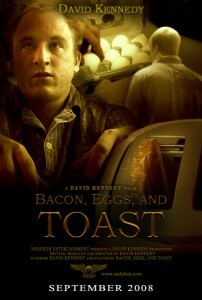 “Bacon, Eggs, and Toast” is a comedy short that I created entirely by myself in 2008. As an avid basketball fan, I found it annoying how frequently my fellow fans would share “dunk highlight videos” on sports forums as proof of a player’s greatness. It seemed to me that you could make literally ANY mundane task come across “epic” if you used quick edits and a pounding soundtrack like “Requiem for a Dream” or “O Fortuna”. This video was my quest to prove that theory. On the surface, it’s just a video of me making breakfast… but I contend that it’s also the most epic video you’ll ever find of someone making bacon, eggs, and toast.